We are so pleased to welcome back to our series the Boulder Bassoon Quartet! 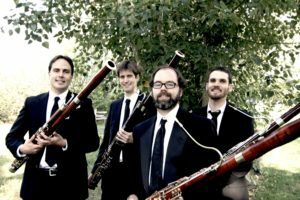 The Boulder Bassoon Quartet will play a program showcasing the full range of the bassoon and its repertoire, including music spanning from the 1700’s to 2019, classical to the blues, composers international and local, original works and familiar tunes, including a selection from their latest album, Off the Record. Tickets are $15 for adults and $10 for students through high school, and can be purchased here as well as at the door the night of the performance. Parking is always free and we’ll enjoy a meet and greet reception following the concert. Trinity Presbyterian is located in Arvada about 8 blocks north of the Arvada Center and 1/2 block east of Wadsworth, at 7755 Vance Drive.